At least 90 migrants from Pakistan are feared drowned after a boat capsized off the Libyan coast few hours ago. According to the United Nation migration agency, 3 survivors of the shipwreck said most of those who drowned were Pakistani nationals. 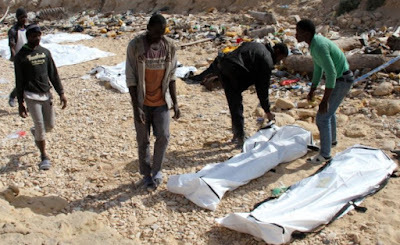 “10 bodies are reported to have washed up on Libyan shores,” the International Organization for Migration (IOM) said in a statement. A spokesperson said Pakistanis were increasingly trying to make the perilous crossing to Italy. Many are packed into unseaworthy vessels by smugglers who then abandon them to their fate in the Mediterranean Sea. All the way from pakistan next door to india heading to italy via libya.that spirit for dat mediterran sea must be powerful to be consuming all races.even italian economy no even get head at the moment.